It's a beautiful sunny day. We gotta wear shades (I'm evidently a child of the 80's). Check out that amazing blue sky! (No filter) Photo by Points of Light Music. And look there's another labyrinth popup! There's a few visitors touring the new finished renovations of the capital building. One guy asks: "Are you guys drunk?" I reply, "No, we're stone sober." Start with setting intentions in front of the Veterans Service Building. We walk down the right side. Shuffle across the street. Restart again. The sidewalk has a pattern of a darker on-point square in the middle of the typical concrete and I enjoy watching my shadow spread my justice and peace energy as I walk up using the angles as my guide. We find ourselves in front of the steps and sing a reminder of the light and love in every person. End with gratitude. Then we ventured inside for a look-peek. Do a little impromptu humming in the rotunda. And then walk back the other side of the mall. Weather: overcast but not windy or freezing. I didn't wear my snow boots or extra cushy socks so my toes get cold. As we three are chatting by the Gold Star Table, I notice capital security has pulled into the parking lot. Since it's a federal holiday, we're the only ones parked there. We trot over to ask if it's ok and confirm the holiday and that the meter doesn't need to be fed. We're fine, he reassures us. Convening in front of the Veterans Service Building I notice the beautiful lotus-like sculpture in the center of the fountain(?). Does anybody know its background or its creator? There's so much beautiful and meaningful memorial installations on the Capital grounds. If you haven't had a chance go and explore! Today we decide to walk the left side up to balance what we did yesterday. It's lovely having another person to add to our harmony. As we make our way across the lower quad, I notice another (the same?) security vehicle in a different lot. They seem to be watching us? When we reach the street, we sing but don't walk the slow pace across. Over the course of the chant we advance 8 steps so crossing a four lane street would take at least 4 repeats. Not worth risking our safety or inviting question. 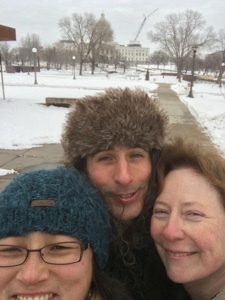 I've been watching two group of folks milling about on the capital steps since we started. Now that we're closer it seems like some are logistics organizers for the Women's March and another group is live streaming a promo of the musical acts appearing at the March ... But we don't know that until we've photo (video?) bombed part of it. Oops! 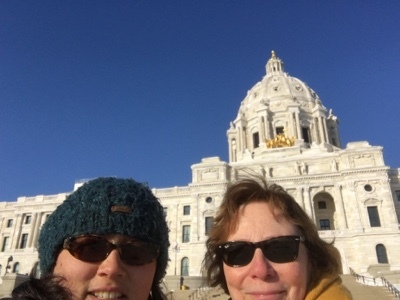 Today's trio ends by climbing the steps to the capital doors (locked due to the holiday) and then sending out prayers of blessings for all people from that incredible vantage point that views the river straight ahead and the Cathedral of St. Paul slightly to the right. Weather: overcast like yesterday. It rained overnight and at home I slipped on the slanted, wet icy sidewalk (triple threat, can't win!) and fell on my tush taking out the recycling last night. 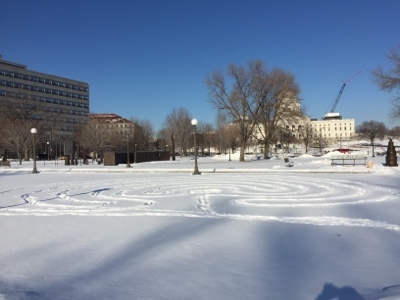 Fortunately, the capital grounds folks are totally on it and the sidewalks are well salted for the opening of this week's session. Thank you! 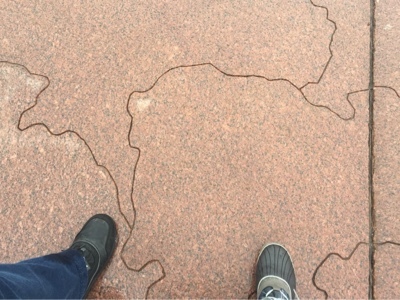 Our feet stepping out at the Vietnam War memorial installation at the Capital. Walkers: it's just Patti and I. We walk the labyrinth that appeared the other day, check in, and then head to our starting place. Today there are folks working in the buildings and walking here and there. A different vibe than the last couple days. But we begin again. Setting our intentions we recognize the cloud of witnesses surrounding us and this place, all people from the past, including the indigenious, and future as well as the thousands planning to be attending the March on Saturday. It is a bit awesome to behold. We reach the lower steps and move through our closing ritual. Our closing song are the words of Joe Miller, a Buddhist blessing: "May all beings be well / May all beings be happy / Peace, Peace, Peace." But I know another version of it with an additional line and it was calling to me on my drive home yesterday. Saying "I need to be said." The line is "May all injured be healed." Telling my partner this, she affirms it is important to recognize this. We gloss over trauma in so many ways and the only way to move forward is to recognize it. Otherwise it gets stuffed down and remains undealt with causing unforeseen problems in the future. We step forward again for the next three days. Join us at 2p in front of the Veterans Service Building or from work, home, or wherever you are. More details here. Peace and blessings.